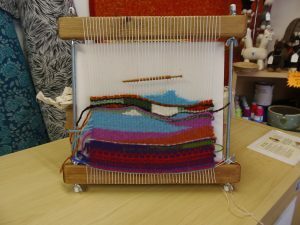 There were lots of busy fingers diligently working in the Coco Alpacas shop this Tuesday (October 11th) when Fiona Nisbet lead a tapestry weaving workshop which was fully booked. 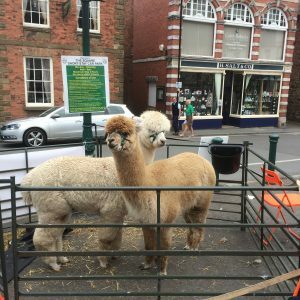 At the beginning of the month there was Musicfest in Church Stretton – took 2 alpacas, Freddie & Finn who were in the square for most of the day- very popular with people asking lots of questions about them and taking photos. We were in the Shropshire Journal the following week. April was an exciting and eventful month, concluding with a special event at the Coco Alpacas shop on April 30 to celebrate traditional British wool shops. The event, Yarn Shop Day, was part of a national awareness event to promote brick-and-mortar wool shops. 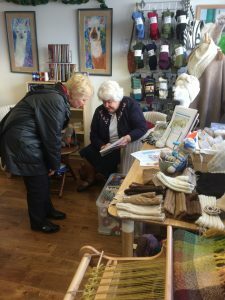 In a real shop (instead of a virtual one) customers can see and feel the quality of different knitting yarns and receive free-of-charge, personal advice on their creative projects.